Pictura ab Hammatt Billings facta pro prima Uncle Tom's Cabin editione (Bostoniae: John P. Jewett and Company, 1852). Cassy, una ex Legree servis, auxilium Avunculo Tom verberato dat. Uncle Tom’s Cabin; or, Life among the Lowly ('Tugurium Avunculi Thomae; aut Vita inter Humiles') est mythistoria abolitionismi a Harriet Beecher Stowe anno 1851 in diariis edita et die 20 Martii proximo anno liber divulgata, et statim in vulgus gratissima—fabula quae, odium in Legem Servorum Fugitivorum anni 1850 magnopere auxens (McPherson 1988:88–91), initium acceleravit Belli Civilis Americani (Kaufman 2006:18). Harrietta Beecher Stowe. Caelatura anni 1872, ex pictura olea ab Alonzo Chappel. "The fugitives are safe in a free land." Adumbratio, prima editio. Simon Legree Avunculum Tom adgreditur. Gates, Henry Louis, et Kwame Anthony Appiah. 2005. Africana: Arts and Letters: An A-to-Z Reference of Writers, Musicians, and Artists of the African American Experience. Running Press. Jordan-Lake, Joy. 2005. Whitewashing Uncle Tom's Cabin: Nineteenth-Century Women Novelists Respond to Stowe. Vanderbilt University Press. Kaufman, Will. 2006. The Civil War in American Culture. Edinburgh University Press. Lott, Eric. 1993. Love and Theft: Blackface Minstrelsy and the American Working Class. Novi Eboraci: Oxford University Press. Lowance, Mason I., Jr., Ellen E. Westbrook, et R. De Prospo. 1994. The Stowe Debate: Rhetorical Strategies in Uncle Tom's Cabin. University of Massachusetts Press. Rosenthal, Debra J. 2003. Routledge Literary Sourcebook on Harriet Beecher Stowe's Uncle Tom's Cabin. Routledge. Sundquist, Eric J., ed. 1986. 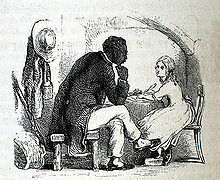 New Essays on Uncle Tom's Cabin. Cambridge University Press. Tompkins, Jane. 1985. In Sensational Designs: The Cultural Work of American Fiction, 1790–1860. Novi Eboraci: Oxford University Press. Weinstein, Cindy. 2004. The Cambridge Companion to Harriet Beecher Stowe. Cantabrigiae: Cambridge University Press. Williams, Linda. 2001. Playing the Race Card: Melodramas of Black and White from Uncle Tom to O. J. Simpson. Princeton University Press. Eliza gelidum transit flumen, in proscriptions theatri anni 1881. 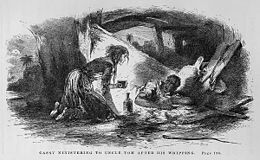 Uncle Tom's Cabin, available at Internet Archive. Scanned, illustrated original editions. Novissima mutatio die 20 Martii 2019 hora 12:01 facta.